The ‘Downer cow syndrome’ affects pre-calving and post-calving cows wherein the animal suffer from weak leg muscles thus making it difficult for the animal to get up (from sitting position) or stand or walk. Such a condition can be fatal in the absence of any intervention. 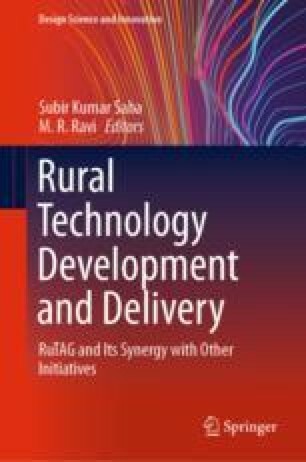 The present work documents the experiences and methodology acquired by RuTAG IIT Bombay while designing a portable cow lift for the ‘Downer cow’. The authors are grateful for funding and support from Office of Principal Scientific Advisor to the Government of India, for giving the opportunity to work on the project under RuTAG IIT Bombay. Authors would like to thank Dr. Ketaki Bapat for her support and Dr. Sudhir Ranade, Yogesh Patil from Gopal Goshala for their help in conducting trials. We are also thankful to Dr. Mahendra Bale and Dr. Dhuri from Goa Dairy without whom the trials could not be conducted in Goa. All procedures performed in studies involving human participants were in accordance with the ethical standards of the institutional and/or national research committee and with the 1964 Helsinki declaration and its later amendments or comparable ethical standards. Also all applicable international, national, and/or institutional guidelines for the care and use of animals were followed for the purpose of studying animals suffered from the above-mentioned diseases and testing the prototype developed. Informed consent was obtained from all authorities where the study has been conducted to include animals in the study.